Ever since I got the Cricut for Christmas last year, it has really encouraged me to get back into crafts. 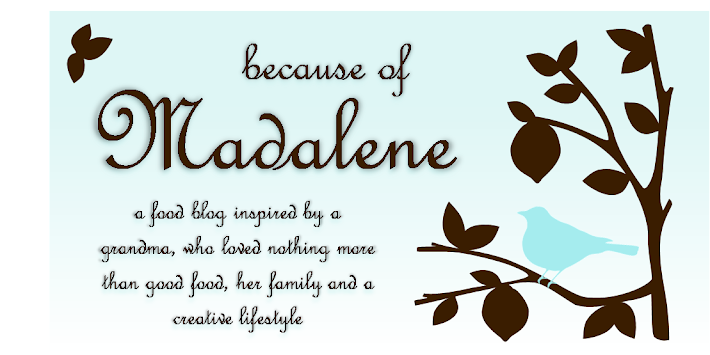 This machine makes crafting and scrapbooking so much easier and faster. At first I thought this gadget would limit my creativity because it makes the shapes, characters, and objects for you. 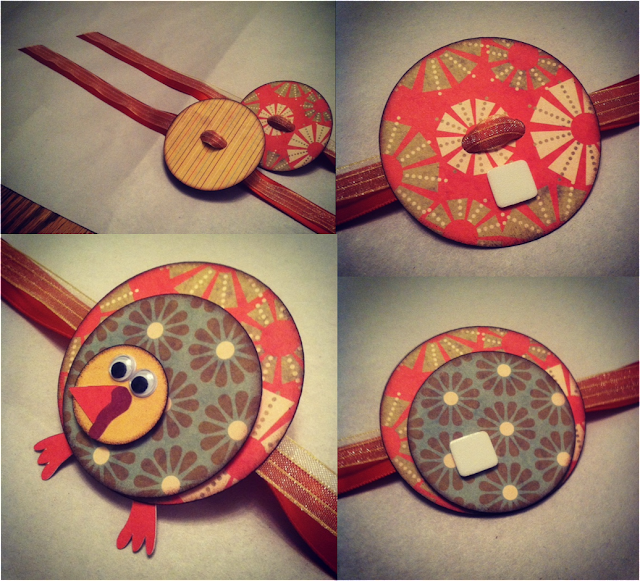 So, when I couldn't find a good turkey in any of my holiday themed cartridges, I decided that this was now a great opportunity to make my own Modern Turkey Napkin Holders by just using the gadget to help me cut out circles, bird feet and beaks. And they turned out great! They will look so festive on my Thanksgiving table this Thursday. I found some Fall colored scrapbooking paper at my local craft store that I thought would be perfect for this project. This kind of paper is thicker and will hold up better than your average paper. I used my Cricut to cut out 2 1/2 in., 2 in., and 1 in. circles, bird feet and beaks for the shapes that make up the turkeys. If you're great with scissors, by all mean, give that a go, but I'm not too precise with the blades so I stick to a machine that can do it for me perfectly and in a few seconds. I did, however, have to cut out my own "gobblers" because the Cricut didn't have the option to do that. Find some fun googly eyes to give your turkeys life. With a hole puncher, punch out two holes in the center of the biggest 2 1/2 in. circle for the ribbon to feed through. Dab the edges of all the circles with dark brown Chalk (ink sponge) to give the bird more pop and definition. Find some festive ribbon and feed it through the holes. If you want to be able to tie a bow around the napkin, cut the ribbon 16 in. long. If just a plain soft knot, 10 in. should do. It's now time to layer the turkey. Instead of using glue, use 3D double sided tape squares to give the turkey depth and shadow. Place one on the bottom layer. 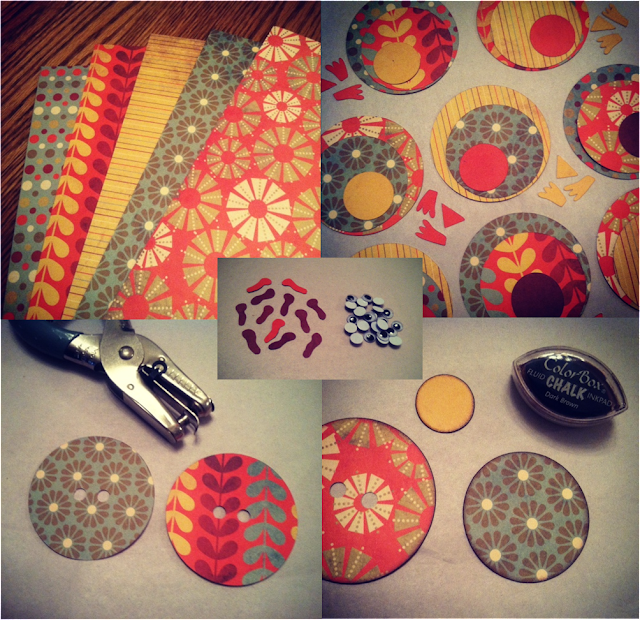 Then put your second circle down and then place another tape on top of that layer. Glue the beak, "gobbler" and eyes on the smallest circle and place on top of the tape from the second layer. Finish it off with gluing on the feet. Let it dry for 30 mins. 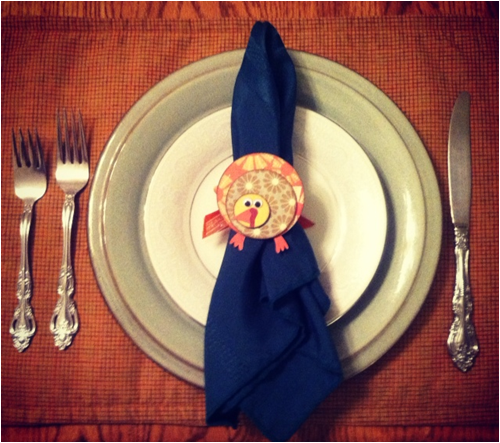 before tying it around your napkin and you've got yourself a napkin holder for Thanksgiving! how cute! 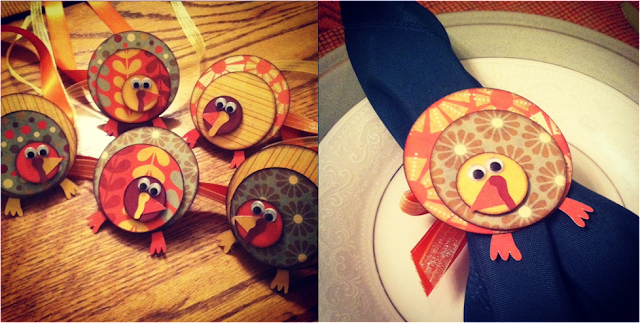 these are so creative and will look so festive in your thanksgiving place settings. great diy! These are just too cute! You are so creative! Love it! Thanks, Kelly. These were fun to make!